Last summer, headed outside to trim fresh cilantro, I found that all four of my plants had bolted (gone to seed) over the last few days. Crestfallen, I went back inside to see what I could improvise with. After a few unsuccessful minutes, I turned around, went back outside with scissors, snipped off a sprig of the coriander that had flowered and started munching. I discovered something that afternoon, and although it felt world-shattering at the time it seems so obvious now. We have become so accustomed to using familiar parts of our plants, that many times we serendipitously deprive ourselves of these seasonal, fleeting luxuries. Each of these previously-maligned flowers had a small young green coriander bud growing in the center, and burst with the exact same citrusy freshness I had originally gone outside in search of. Imagine how frustrating it would be to see “coriander blossoms” listed in a recipe. Here I was, walking out to my garden and seeing four plants full of them, and thinking what a waste it was. Over the next three weeks, I successfully used this new (to me, at least) part of the plant in several recipes until the short period of flowering was over. Since then, I have tasted the blossoms of several plants in my garden, including rosemary, lavender, sage, chives and garlic. Although it may seem simple, garnishing a batch of lemon lavender scones or a rosemary garlic baguette with the corresponding blossoms can really be a unique and memorable treat to share. Below, I’d like to share with you my current method for sugaring–or candying–these blooms so they can last three months or more in an airtight jar. I love to keep them in a glass mason jar on an open shelf. *Note: This method requires raw egg whites, which I don’t mind since I’m using eggs from my own hens. I’d recommend using the freshest, high-quality eggs you can find, with no cracks in the shells. If an egg-free method is necessary, simply omit the egg white and follow the recipe without. Combine the water and sugar in a heat safe bowl and heat in the microwave to dissolve the sugar, 1-2 minutes. Or, heat in a saucepan until sugar dissolves. Allow the simple syrup to cool to room temperature, then gently whisk in the egg white and extract of your choosing until incorporated. Pour into a small bowl. If using granulated sugar–superfine sugar can be hard to find–quickly process the sugar in a food processor until pale and powdery, about 1 minute, and return to the plate. Holding each flower by the stem (use tweezers if you must), dip the entire flower into the egg and sugar wash, using the paintbrush to brush off excess wash so no big droplets remain. Some flowers may fold in half, but don’t be daunted. Use the paintbrush to gently open each bloom, ensuring that both the front and back of the bloom are coated. Moving the bloom face down to hover over the plate of fine sugar, use the spoon to gently dust the back of the bloom with sugar. Turn the bloom face up and gently dust with sugar. Feel free to shake any excess sugar off. 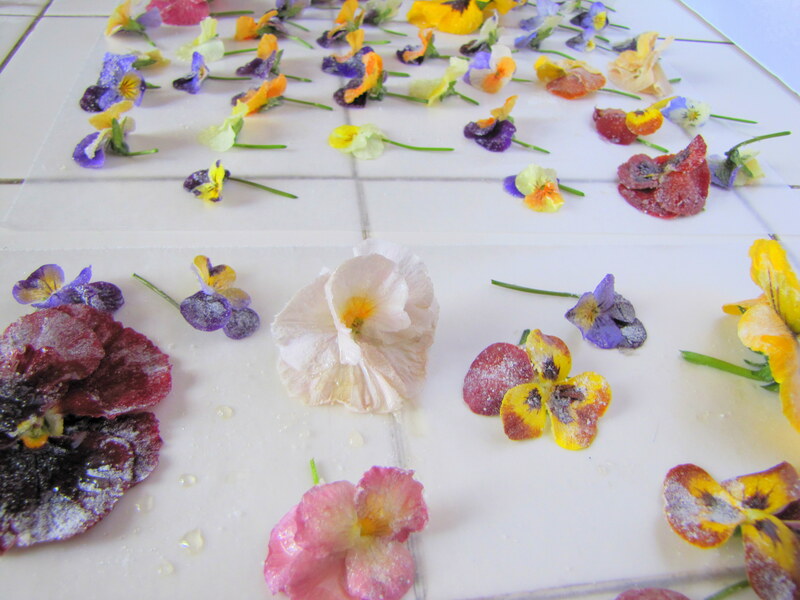 Gently place each bloom face up on the wax paper. Repeat. Once all the blooms have been sugared, allow to dry for 1-3 hours. Allow to dry for 24 hours, and then transfer to an airtight container to keep for three months or longer. While I was at it, I wanted to try to sugar a few peppermint leaves as well. They are a delicious, vibrant green–success! This is what I mean by “fearless food”–don’t be afraid to experiment. For any larger flowers that seem too big to use as a garnish, gently pluck the petals and individually sugar the petals. For any experimentally chosen flowers, I’m personally not afraid to do some online research to be sure they are safe to eat first, and then try several to see how much their flavor differs from plant to plant. I’d encourage you to do the same; you never know what you’ll discover.